There has been a significant rally in cryptocurrencies as a whole over this entire week, with a substantial part of that gain being made over Thursday and Friday. However, it’s important to recognize that when we enter the weekend, volume generally drops and so does price. Now that’s not to say we don’t see big rallies over the weekend, but after some excessive gains over a two day period, a period of profit taking is normal. If we look at the Ichimoku system on the 4-hour chart, we see that price is somewhat halted near this 6500 value zone. If you notice the two black arrows pointing down, they begin at two spots: the current candlestick and the Lagging Span (black line). One of the interesting and often overlooked behaviors within the Ichimoku system is that the lagging span will respond to areas of support and resistance just like price does. With the current candlestick, there is a shared resistance zone that both the lagging span and price have: the cloud. Price is currently right up against the top of the cloud and the lagging span is facing resistance right up against the bottom of the cloud. Price has a very difficult time trending higher when both price and the lagging span have a shared resistance zone. It is very likely that Bitcoin will move to test the 6300 consolidation zone again before we get another drive higher. A retest of this zone, for me, would be very desirable because not only would it show some evidence of an honest break higher, but it would confirm strong support. Within the 6300 value area, we have an inner 4/8th harmonic level (light blue horizontal line) as well as the 4-hour base-line (red average line). 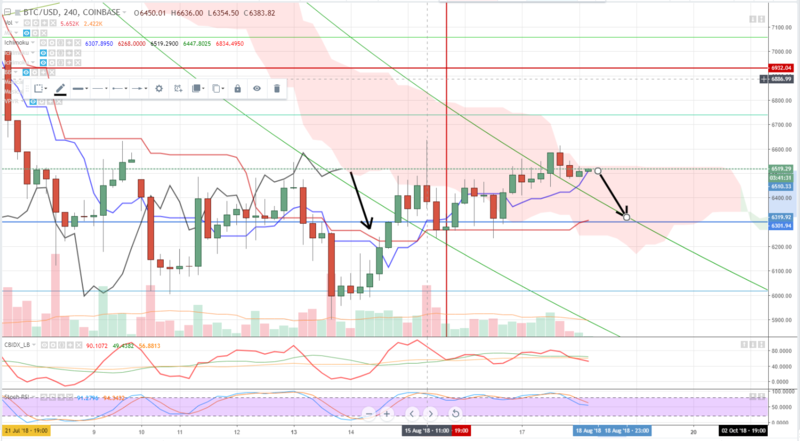 What is great to see with this current price action is that the 4-hour Ichimoku is setting up for a nice breakout condition over the following 4-days. We already have a great breakout on the 1-hour Ichimoku. So if we get a retest of the 6300 zone, that would confirm the 1-hour Ichimoku as well. Very exciting price action moving forward!